These are sources to which the body is exposed at greater distances. They include microwave ovens, wireless Internet routers, smart meters, and radio, TV, and cell phone antennas. Exposure from environmental sources is generally much lower than established exposure limits. The effects of RF-EMFs at exposure levels above established limits are well characterized. Exposure limits established by regulatory bodies are determined so as to prevent all established adverse health effects. The potential effects of RF-EMFs have been the subject of numerous studies on cells, animals, and humans. 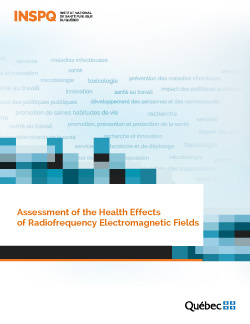 Although current research does not allow us to entirely exclude the possibility risks, no short- or long-term adverse effects have been established as a result of exposure to RF-EMFs within the established limits. A certain level of scientific uncertainty persists about the potential effects of long-term exposure to cell phones, and a number of epidemiological studies on this topic are underway. Some people report symptoms they believe are caused by RF-EMFs. The existence of these reported symptoms is not in doubt. A wide range of symptoms is reported and their severity varies from one person to another. However, the good quality studies conducted on the subject have failed to uncover any links between these symptoms and exposure to RF-EMFs below the established limits. It is recommended that monitoring and research be continued, that the public be kept informed of new developments, and that measures be put in place to help people reporting symptoms they attribute to RF-EMF exposure.